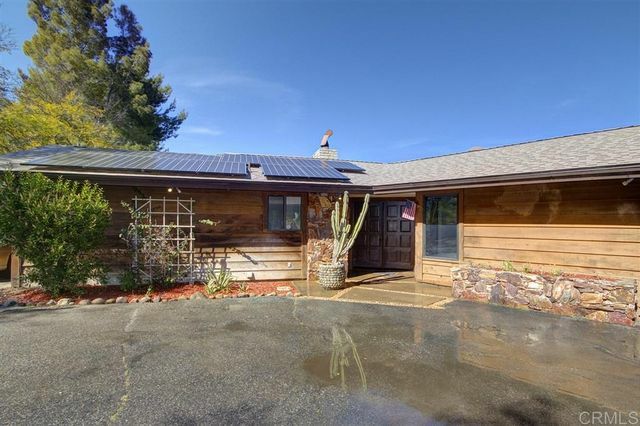 Clean, rejuvenated ranch home atop 5 acres with well, solar and greenhouse. Panoramic views, abundant natural light, picturesque back patio. Lot features lavish and assorted array of fruit trees plus additional areas for accessory dwelling units or split. Valley Center lifestyle, 12 minutes from I-15. Come see the long list of improvements including windows, Coretec vinyl plank flooring throughout, plus a new Carrier central air system. Perfect for anyone wanting plenty of peace, privacy and room to grow. Masterfully upgraded & remodeled throughout with beautiful hardwood flooring, ceramic plank tiles floors, rich dark cabinets, marble counter tops, stainless steel appliances, upgraded fixtures & modern lighting throughout. 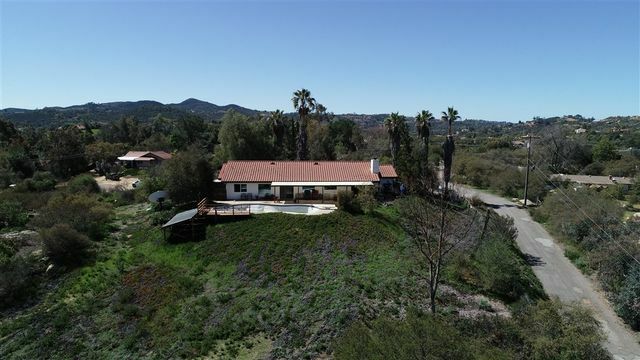 This is a great home for entertaining or just connecting with your family- this home offers a great open floor plan that will bring your family together in the main living space with Oak Trees surrounding for privacy. Expansive private deck and Solar that is paid for!!!! Wild Oaks Ranch. 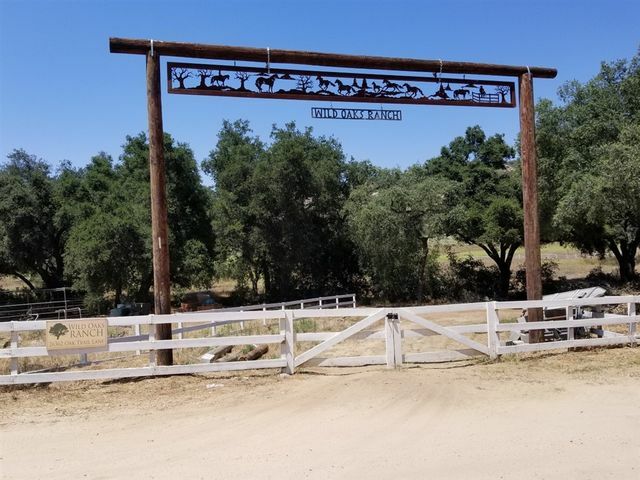 Beautiful 20 acre Ranch site located in a convenient Valley Center Location. Close to all. 5 minutes to the Valley View Casino. 10 minutes to Lake Wohlford. 20 minutes to Downtown Escondido. Wonderful horseback riding throughout the area. Complete white split rail fencing around the entire 20 acres. Well on the property, pumping 10 GPM. Recently tested by Johnson Brothers. Much of the property is flat and level. Many mature Oak Trees. 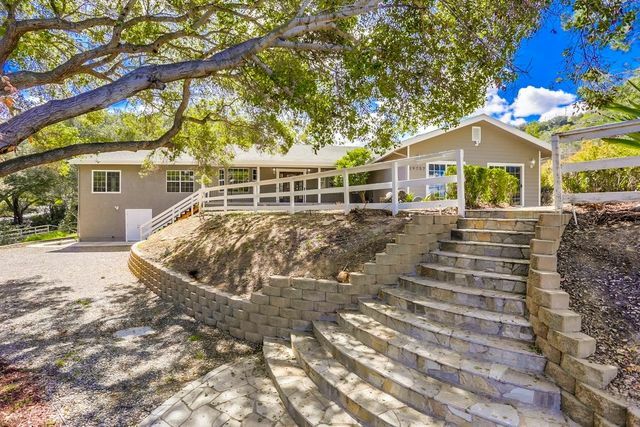 A one of kind opportunity to create the dream ranch. 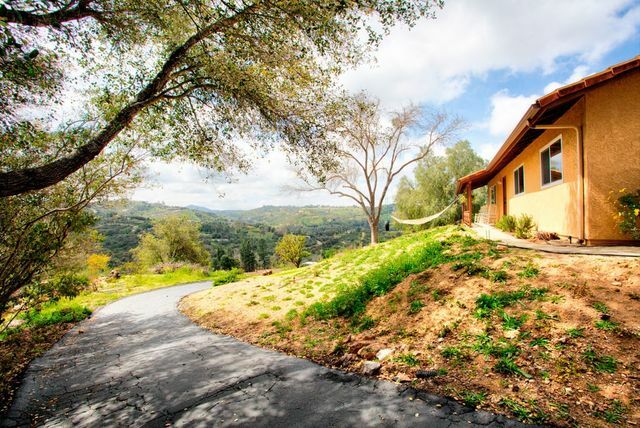 Enjoy complete serenity in this secluded rustic home with stunning panoramic views. The living room features high exposed beam ceilings, a stone fireplace and picture windows that frame the views and bath the room in abundant natural light. New quartz kitchen counters, fresh paint, and newer laminate flooring throughout the main floor. Master bedroom is on the entry level. Convenient circular driveway and ample storage. Home has electric solar and AC has a 8-year transferable Warranty. Roof is 2yrs old. Panoramic 360 degree VIEWS! 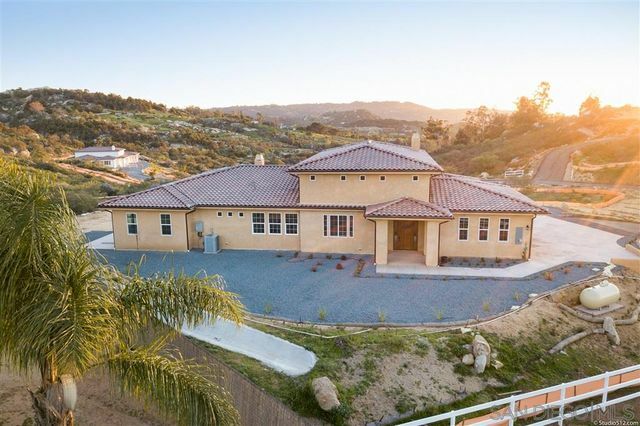 2.5 acres of gently sloping land with impressive rock formations & native chaparral, fully fenced in. Floorplan is expertly designed so none of the 4 bedrooms share an adjoining wall! Newer furnace & AC, vinyl dual pane windows, stone fireplace & 3 car garage. Solar Panels are owned. Pool liner needs repair, but equipment appears to be in good condition. 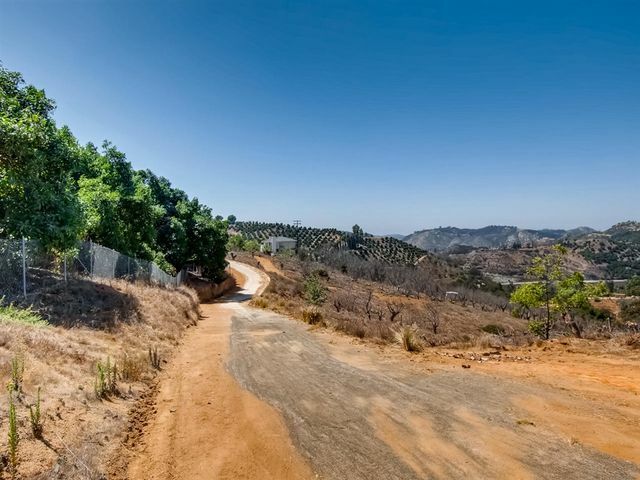 Quiet & private location up away from Lilac Rd, yet just 1/3mi from Harvest Farms Village. Stunning Sunrise & Sunset Views! Authentic Adobe ranch home with lot's of charm. Large great room with Living and Dining room and beautiful exposed beam wood ceiling. Floor to ceiling fireplace, detached garage with full bath and 1 stall separated for additional use options. Gentle land, fabulous views and setting. Perfect location for gentleman farmer. Includes APN #133-301-25. West Valley Center. 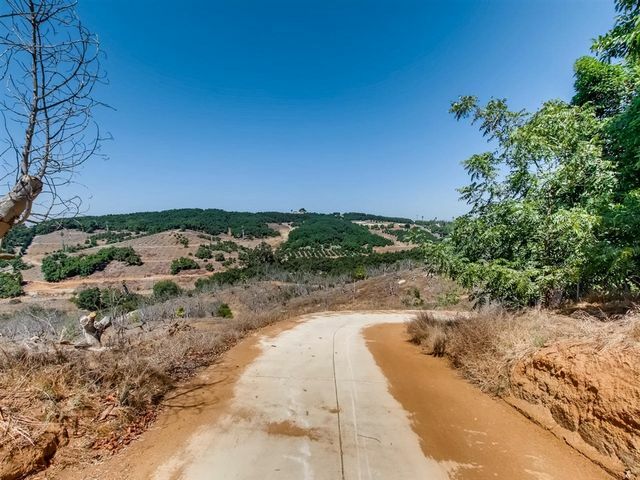 Ready to Build Gated, Secluded, Hilltop views, Private Road Minutes to I 15 and Gopher Canyon Road. One of 3 contiguous lots that range from 4.53 to 6.4 acres Each. Easements in place for the road All cross lot easements are in for the water. 1 inch Water Meter with T is in place. Septic ready to install as per parcel map Bring your house plans Vacant Lot Financing with 20-25% can convert to construction loan then to permanent financing.